Assistive Technology is a term that typically describes various devices and software that a person who is blind or visually impaired can use to operate a computer, take notes and access type written material. The primary types of assistive technology include: closed circuit televisions (CCTV), screen magnification software, screen reader programs, refreshable Braille displays, scanners, and note takers. A closed circuit television (CCTV) is a reading system which enables someone who is visually impaired to enlarge material up to fifty times the normal size. The CCTV is comprised of two parts, a camera and a monitor. Some of the more popular CCTV's are the Clear View, Merlin, and the Amigo. Screen magnification software enlarges text and graphics on the computer screen to allow someone who is visually impaired to navigate, read, review and edit the information on the screen. Users can change the size and shape of system fonts, enlarge icons, enhance the mouse pointer, and alter screen colors to their specific requirements. Two leading screen magnification programs are Zoomtext and Magic. Screen reader programs use speech output with a computer to allow people who are legally blind to navigate, read, review and edit information as it is displayed on the computer screen. The screen reader allows the user to interact with the computer via the speech output and the keyboard. Through the use of keyboard commands, screen readers work in conjunction with standard applications like word-processors and web browsers to produce an accessible screen format. Two of the most popular screen reading programs are JAWS and Windoweyes. Refreshable Braille displays use a specialized hardware device that works in conjunction with a software program. 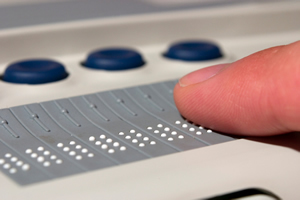 The software program translates text from the computer screen into Braille and then displays the material onto an external hardware device called a Braille display. The Braille display consists of a strip containing a series of very small pins that emerge to form a temporary line of Braille text. As the reader moves from one section of text to the next, the pins shift, and the new data is displayed. Two examples of Braille displays are Focus and BrailleEx. Scanners can produce documents in electronic form from type written pages. Using Optical Character Recognition (OCR) software a scanner can generate a type written document into electronic format onto the computer and it can then be read and/or saved for later use. Two leading examples of OCR scanning software are Kurzweil and Open Book. Notetakers are portable PDA devices which enable persons who are blind or visually impaired to conduct business transactions away from their computer, record notes at meetings, plan meetings, search the Internet and send and receive email. These note-taking devices also have the option of refreshable Braille displays, and can also be connected to a computer where various synchronization tasks can be performed. Two top running note takers are the Braille Note and the Pac Mate.